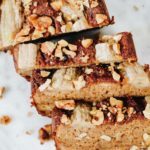 So you know how I love banana bread, and just had to make an egg-free version of it? 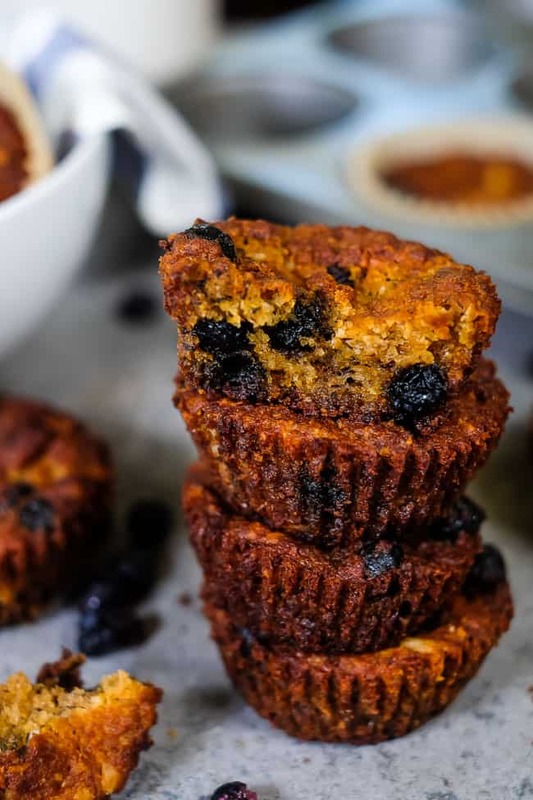 Well, the same thing happened with these Paleo blueberry muffins. 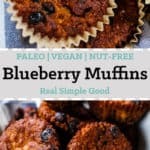 I looovveee blueberry muffins, and just really missed having some muffin goodness in my life, but now we have been enjoying these Paleo blueberry muffins that just so happen to be Gluten-Free, Vegan, AIP + Nut-Free too! 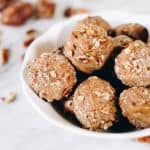 They are an easy to make and a family-friendly Paleo snack! I never really expected I’d ever focus on either Vegan or AIP baking. AIP is the Autoimmune Protocol in case you aren’t familiar with that. And yet, here I am. While I don’t subscribe to Vegan (Ha! We definitely eat a decent amount of animal proteins and products!) or AIP entirely, I have stopped eating eggs because I seem to have an issue with them. I’ve also tried to refrain from making all baked goods with almond flour. It’s easy and works well, but there are more gut friendly ways to eat, so…there’s that. No eggs or almond flour makes baking a little tricky in lots of cases, especially all the bread things. So…lots of experimenting and playing have gone down in our kitchen. 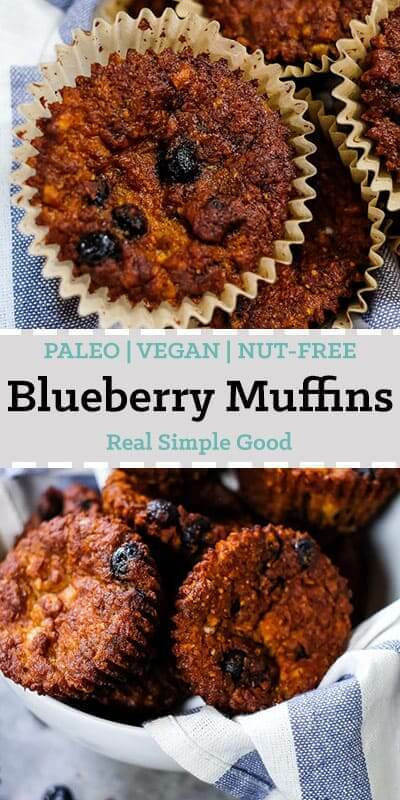 And I’m happy to share these Paleo blueberry muffins with you finally! 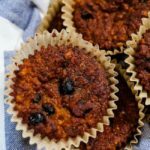 I think you’ll love them even if you aren’t trying to avoid eggs or nuts, and if you are these Paleo blueberry muffins will be a real treat! 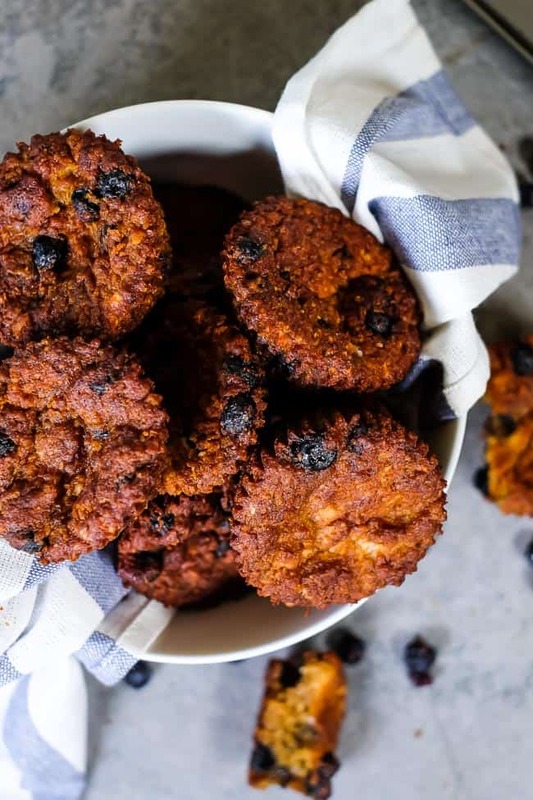 The secret ingredient in these Paleo blueberry muffins is coconut butter! It is pure velvety magic! 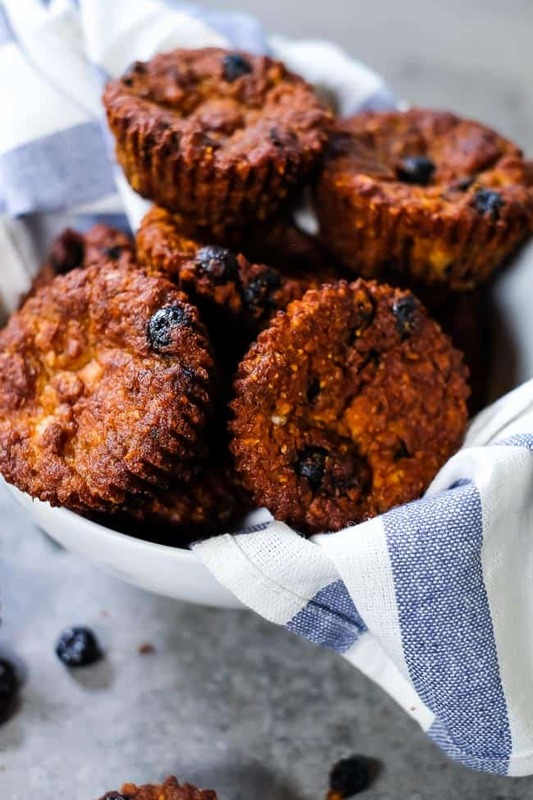 Something about the coconut butter combined with the banana and the maple syrup just makes these Paleo blueberry muffins melt in your mouth. They don’t rise as much as a traditional muffin, and yet the texture is quite amazing! Start to finish, making coconut butter only takes about 5-10 minutes. It’s just shredded coconut turned buttery in a food processor. You’ll notice while you are letting the processor run that a few minutes in, the sound the blade makes as it spins changes. You’ll need to stop the food processor and scrape down the sides. Then, restart and let it run until you hear the audible change again. Stop the food processor and scrape down the sides. Rinse and repeat until the coconut turns into a creamy, velvety texture. It will be very creamy and smooth. 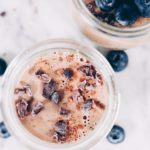 If your coconut is too dry (has been sitting in the pantry for a while), and it won’t seem to turn into coconut butter, just add about a tablespoon or so of coconut oil and continue processing until it is smooth and creamy. 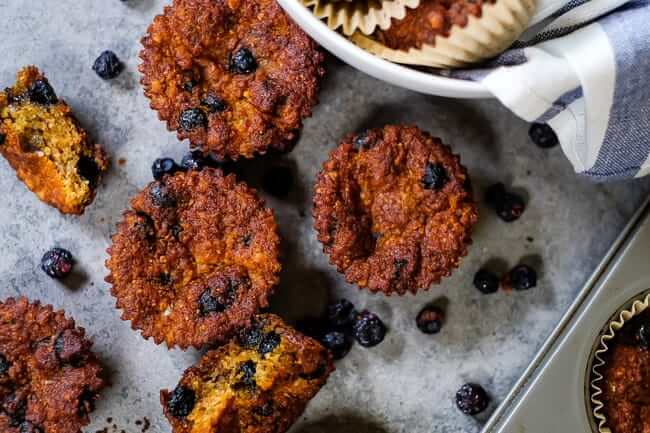 Whether you’re trying to avoid eggs and nuts or not, go ahead and make these Paleo blueberry muffins! 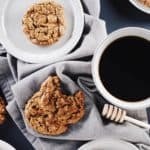 You’ll love how addicting the texture is. Leave a comment below and let us know what you think. Also, take a photo and tag us on Instagram @realsimplegood! We love seeing your posts, and give us a follow on Instagram if you don’t already, so we can stay connected! 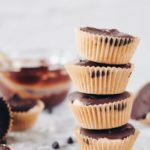 Preheat oven to 350° Fahrenheit and line a muffin tin with parchment or silicone liners. In a medium mixing bowl, combine mashed banana, coconut milk, softened coconut butter, maple syrup and vanilla with a spoon. Add tapioca and coconut flours and sea salt and mix into a batter. Add baking soda and then apple cider vinegar right on top of the baking soda. It will fizz up and then mix it into the batter. Fold in blueberries and scoop into lined muffin tin. Place in the oven and bake for 20 minutes, until the tops start to brown. The muffins will brown on top more or less depending on how ripe your bananas are. Once done (when a toothpick comes out clean), remove from the oven and cool. Once cooled, store in an airtight container on the counter or in the fridge to make them last a little longer. Thanks for sharing. 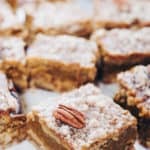 These look delicious and I am excited to make a batch. Would frozen or fresh blueberries be a decent substitute here? I otherwise, have all ingredients in stock. Thanks so much for the feedback! I will see what I can find for dried in this case. You’re welcome! Look forward to hearing how it goes!